March is here and so we turn our thoughts to the driving season ahead. For many members, their Porsche has been tucked away for the winter, protecting it from the snow, road salt and less-than-ideal driving conditions. Read about upcoming events that will give you a chance to exercise your Porsche in the company of other region members. Invite a friend to join you for a region activity to see what we're all about. In this issue we also recap recent events. Check out some pictures of the serious judging and sampling that took place during the 2011 Carrera Chili night. The following are the events on the calendar for March and April. To view events that have already been scheduled for other months in the year, visit the Calendar tab on the left side of the home page of our region site. More events will be loaded as committee chairs finalize their work. March 3 board meeting. Members and guests are always welcome and encouraged to attend. The meeting begins at 6:30 p.m. at Brew City Grill, 10250 N Cedarburg Rd., Mequon, WI 53092. Brew City is on Hwy 57 between County Line Road and Donges Bay Road. March 5 social events planning meeting. Help the region plan social, casual events that you’d like to attend. Bring your ideas to our planning meeting. Details here. March 8 Registration opens for the 2011 PCA Porsche Parade. Details here. April 3 Cars and Coffee. Region member Jurgen Rott and his business partners host a casual get together on the first Sunday of the month at 2Shores in Lake Mills. This is not a region-sponsored event but a great reason to get together and an excuse to take your Porsche out for a Sunday drive. Details here. April 7 Board meeting. Location change. Members and guests are always welcome and encouraged to attend. The meeting begins at 6:30 p.m. The April meeting will be at the offices of Clifton Gunderson, 10001 Innovation Drive #201, Milwaukee, WI 53226. Access off of Hwy 45 and W. Watertown Plank Road. For map visit this link. April 9 DE tech session. Learn about DE in this chalk talk session. This will be a useful event for all levels: the “just thinking about it" individual, the "ready to try it" novice and the experienced DE entrant. Details here. April 23 - All Porsche swap meet in Central PA. Courtesy announcement for our Central PA Region PCA friends. If you are restoring a Porsche or looking for a project, this may be a worthwhile trip to Pennsylvania. Details here. April 30 casual car show at VA Center. Our region has been delighting the veterans who live at the Zablocki Medical Center with this annual casual car show. Bring your Porsche to this event. Spend a few hours with us. The veterans and staff from the hospital love to check out the cars and talk to the owners. We usually have a nice representation of models and years. Help us continue this tradition. Details here. We also welcome Karl Schulz and his wife/affiliate member Nancy Schulz, who transferred to our region from the Rally Sport Region. Karl and Nancy live in Lannon and drive a 1974 914. The Milwaukee Region strives to provide short vignettes about its members through this column. Recently joined and seasoned members alike are invited to share their story about themselves and their Porsches. Send a note to region online newsletter editor to have your story included in this regular column. Contact the newsletter editor via e-mail at beverly.jurkowski@sbcglobal.net. Thanks to Michael Elliott and Marc Vandiepenbeeck, some of our newest members, for sharing their story. We look forward to seeing them and all of recently joined members at an event in 2011. Michael Elliott drives a 1999 Boxster with low mileage – just over 60,000. He previously owned a 914 in the mid to late 70s. His interest in getting back into a Porsche is a “long story,” Michael said. “My youngest brother finally got his wife to okay his purchasing another sports car. Their children are all grown now, and he had a Mazda RX-7 before they married. 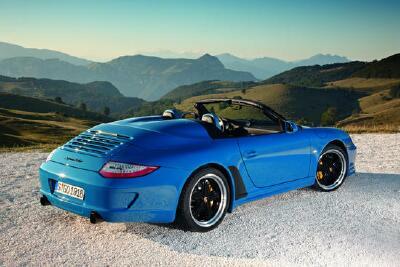 So, once he told me he wanted a Boxster, I started checking the local dealers,” he said. “One dealer had this beautiful, black, 1999 Boxster with just over 61,000 miles. When I called him, he informed me that he didn’t want a black car.” A couple of days later Michael went back and took it for a test drive. A couple of days later he took his wife Lynn over to let her test drive it. “Since it was really starting to grow on me, I purchased the car in June of 2009.” His brother, a member of the Central Wisconsin Region, convinced him to join PCA as well. Michael and his wife Lynn hope to participate in many region events. The Boxster shares garage space with a 2002 BMW Z-3 that the Elliott’s purchased through BMW’s pick-up-your-car-at-the-factory program. Michael is happily retired after more than 35 years in human resources, with the last 17.5 years as a consultant. Lynn Elliott is still working as an HR consultant. Marc Vandiepenbeeck drives a 2007 Porsche 911/997 Carrera 2S Cabriolet, Guards red with turbo twist wheels. It’s his first Porsche. The acquisition can be attributed to relocation to Milwaukee. When his job brought him to Milwaukee from his native country of Belgium, his daily commute to the Johnson Controls headquarters in Glendale found him driving past a Porsche dealership every morning. “Every morning on my way to work, I was passing in front of a Porsche dealership. It took about three years before the temptation became too hard to resist.” He started his Johnson Controls career in 2005 in Belgium. Shortly after that, he was appointed a director in the Treasury department at the headquarters here in Milwaukee. Marc participated in the region’s Road America DE event last year in May. “It was a blast,” he said. He has already registered for the 2011 Hallenbeck Drive Into Spring event in May. We hope to see Marc and his Porsche at other events throughout the year, too. We have 529 members in the Milwaukee Region. Congratulations to these members who are observing a membership anniversary in March. Check out last year's autocross at Miller Park. Video link here. Make sure your volume is up so you can hear the sweet sounds coming from those Porsche engines as the cars and drivers navigate the course. We have three autocross events scheduled in 2011, starting in May. Additional details will be posted to the Autocross events page. Garage session helps to chase mid-winter blahs. About 30 region members got together in mid February to engage in a little tire-kicking conversation about Porsches. Check out the story and photos here. New Carrera Chili champion crowned. Carrera Chili alternates with Turbo Spaghetti as the region’s longest-running social event. For 2011, chili was on the menu. Several members cooked up a batch of their favorite recipe and entered it in the friendly competition on Feb. 5, the eve of the Super Bowl. Read the results here and see who took home the top honors. Check out the region classifieds here. Read the Facts about Helmets here. Porsche sales in January up 34 percent. Check out the narrative here. If black is your ideal car color, check out Porsche's latest introduction -- the 2012 Boxster S Black Edition. Details here. Tips on navigating our site. We built our region website to make it easy for members and visitors to find the information they’re looking for when arriving at the site. Here are a few navigation tips to maximize your site experience.